The Efficient Market Hypothesis (EMH) is an investment theory which states that asset prices fully reflect all relevant and available information. Therefore, according to the theory, consistent risk-adjusted excess returns cannot be made. That means the market cannot be beaten in the long run. However, there are nuances within this theory that account for different types of information and their effects on market efficiency. 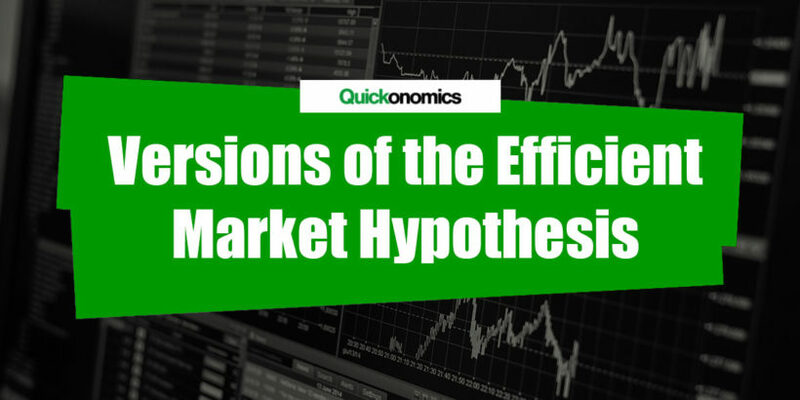 Starting from there, we can identify three versions of the Efficient Market Hypothesis: a weak, a semi-strong and a strong version. The Weak Efficient Market Hypothesis suggests that current asset prices reflect all information about past prices. As a consequence, it is impossible to beat the market by using technical analysis. That means, it is impossible to predict future valuations using the patterns of historical prices. However, according to the weak EMH, information outside of historical prices isn’t reflected in the asset price. Thus, other public information such as the state of the economy, news, management, or cash flows can be used to determine and predict the future price of an asset. This technique is called fundamental analysis. For example, a trader may use a publicly available annual report of a company as the basis of her trading strategy to yield a profit. Let’s assume the report shows promising management decisions, which indicate an increase in future cash flows. According to weak EMH, this information is not reflected in the share price and could, therefore, be used to gain excess returns. Meanwhile, our trader would be ill-advised to base her strategy solely on past price patterns, because this information is already included in current prices and therefore won’t result in any profits in the long run. The Semi-strong Efficient Market Hypothesis argues that current asset prices reflect all information about past prices as well as all other publicly available information. Therefore, neither technical nor fundamental analysis can yield an advantage, as both trading techniques use only public information such as historical prices, mergers and acquisitions, annual reports, and so on. However, according to the semi-strong EMH, non-public information, such as insider trading and other illegal ways of exploiting private information, can still create an advantage. For example, according to the semi-strong EMH, our trader could not gain a sustainable advantage by using information from an annual report or the morning news. However, if she was involved in a major acquisition project, that hadn’t publicly been announced yet, she could use this information to make a profit. However, please note that this would be considered insider trading, which is illegal in practice. The Strong Efficient Market Hypothesis states that all information, both public and non-public, is incorporated into an asset price at any point. Therefore, not only will using technical or fundamental analysis yield no sustainable advantage but neither would the use of non-public information (i.e. insider information). Essentially, the strong EMH suggests that no position allows investors to yield abnormal profits whatsoever. To illustrate this, let’s revisit our example from above. According to the strong EMH, those who are involved in the acquisition project will buy or sell shares until the price fully reflects the additional information they have. At this point, it becomes impossible to yield excess returns even for the people who have insider knowledge. At this point, it is important to note that the EHM does not suggest that pricing anomalies or exceptional traders who make long-term profits don’t exist. However, these anomalies do not contradict or disprove the Efficient Market Hypothesis, according to its proponents. According to them, the theory applies to the majority of traders and the average trade that takes place and therefore accepts that there will be outliers and exceptions to the rule, just like in most other theories. The Efficient Market Hypothesis (EMH) is an investment theory that states asset prices fully reflect all relevant and available information. There are three versions of the EMH: a weak, semi-strong and a strong version. The Weak Efficient Market Hypothesis suggests that current asset prices reflect all information on past prices. Meanwhile, the Semi-strong Efficient Market Hypothesis argues that current asset prices reflect all information on past prices as well as all other publicly available information. And finally, the strong Efficient Market Hypothesis states that all information, both public and non-public, is incorporated in an asset price and thus, there is no opportunity to gain consistent risk-adjusted excess returns.